Keyword searches are quickly losing ground as the main focus of search engine optimization, for both web content developers and Internet surfers. Google is leading the charge to shift the focus away from keywords towards context. This has been made clear over the past couple of years with the demise of their popular keyword tool and more recently the loss of keyword data. However, with the advent of social networks and blogs, increased use of mobile devices and rampant link sharing across all platforms, search engine optimization was already destined to undergo a dramatic change. Context has always been important but now it is vital that web developers consider the intent behind the keywords people use when searching the Internet, if for no other reason than to avoid the shock of watching your website traffic drop in the wake of the next wave of search engine algorithm changes. Most people who use the Internet regularly are savvy enough to realize that they need to provide as much detail as possible when they perform a Google search, but what if they don’t bother? More significantly, what if they didn’t have to? 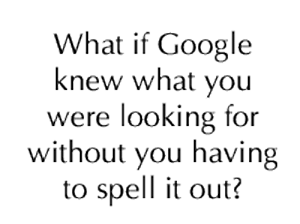 What if Google somehow knew what people were looking for without them having to spell it out in the search bar? “Imagine a prediction of what you’ll be doing next as part of the context of search. It sounds crazy, yet in some aspects, we are already there,” said Tom Anthony, a writer with SEO Moz, in Keywords to Contexts, The New Query Model. ‘Explicit’ search is the actual words you type into the search bar. The other part of the equation is ‘implicit’ search, the things you don’t say but that Google can pick up by noting your location, the device you are using and your online history, among other factors. For example, if someone types ‘taxi’ into the Google search bar, are they looking for a ride home or the 1970s TV show starring Judd Hirsch? By looking at the explicit search query and also considering the implicit data (location – 40 Ave. and 50 St.; device – tablet; history – recently searched local restaurants and current movie listings) Google will conclude that the searcher likely needs a ride. The search engine results page (SERP) will then show local cab companies first. The reality is, the implicit information available to Google goes well beyond your location, device and recent search history. Do you have a Facebook profile? Are you on Google+, Pinterest or LinkedIn? Are you a regular tweeter? Ever ‘liked’ a page, posted a photo or shared a video you saw on Youtube? As far as Google is concerned, anything you do publicly on the Internet is fair game and can be used to improve your search results. Not to mention help determine what ads they will display for your viewing every chance they get. Consider the following scenario. You are away from home and looking for a grocery store to buy some snacks. You type grocery stores into the search bar. There are dozens of possible stores Google could direct you to, but if you’ve already liked Safeway on Facebook or regularly tweet about your love of all things Sobeys, it makes sense that the search engine results page would feature the nearest location of your favourite grocery store and directions for getting there from your current location. But what if the SERP could go beyond simply showing your favourite store at the top of a list of random grocery stores? What if it displayed ads, coupons, in-store specials, recipes and news items related to your preferred store? What if the SERP could inform you when your store was out of a popular item and suggest alternative locations to buy that item? Sound futuristic? Welcome to the future. So what does search engine optimization look like in this new world, where context and intent seem to matter at least as much as specific keywords? At the very least, we need to re-examine our definition of SEO. The main message to content developers seems to be that we can no longer rely solely on keywords when optimizing web pages for the search engines. In fact, we need to start developing pages based on a topic or a specific client need, rather than focusing on just one or two individual keywords. Keywords will always help clarify a user’s intent, but as Google moves from indexing to understanding, the link between keyword searches and search engine listings will no longer be as direct as it once was. “We need to be focusing on what the user is looking for rather than specifically all the ways they can phrase it,” said Kate Morris, a writer for SEO Moz, in Stop Thinking Keywords, Think Topics. So much of what we read on line these days suggests that SEO is dead or dying, but that simply isn’t the case. SEO is not dying but it is certainly evolving. 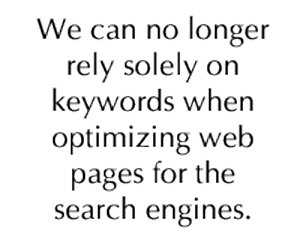 We can’t simply apply our efforts to rising the ranks of the search engines and call that good enough anymore. In fact, one could even go so far as to say search engine rankings are less important than they once were, considering all the different ways that exist these days for people to find our websites, besides organic searches for the products and services we provide. That is not to say that search engine rankings don’t matter. Of course they still do and always will. The point is, the SERP ranking is not the be all and end all that it once was. If you want to drive traffic to your website – and more importantly keep people there long enough to convert them to customers – your website must still rank high on the search engines but also be linked through your social networks and blog articles. Plus, it has to load quickly, be easy to navigate and generally be a pleasant place to spend some time. That means providing a lot of valuable content, with a focus on topics as well as keywords. By applying this ‘new’ SEO strategy, we actually reduce our dependence on Google and the other search engines to drive traffic to our websites and assume full control of the success or failure of our own websites. At that point, the search engines can make whatever changes they want without seriously affecting the bottom line of our websites or our businesses.